I found a recipe on pinterest the other day that I had to try. I made a couple of very minor adjustments to the recipe(like I always do…can’t seem to leave recipes ‘as is’) and then I was in the kitchen baking. The prep time was probably only about 10 minutes(though it cooks for nearly an hour) and it’d be half that if you already had almond milk made up, which I didn’t so I made some from scratch. I LOVED this recipe! Scott, Jane and Charlie had some too and they all really liked it. It’s a definite keeper. I made it in an 8×8 dish and we were able to have leftovers for a day which were also SO yummy! The blueberry sauce and whipped cream were necessary toppers for me(or I suppose you could just add a little of your favorite milk instead of the whipped cream) and I also really liked having a few chopped, raw pecans. I made my own whipped cream with some agave in my Blendtec which just took a few seconds. So healthy, so filling and satisfying. The next time I made it, I put all the dry ingredients together in a bowl the night before with a note out for my husband(who wakes up early to read and exercise…I do those things in the day if you were wondering 🙂 ; I plan on waking up earlier once this baby is born) with instructions to preheat the oven and then add this much milk and blueberries, stick it in a pan and cook it this long. It only took him a minute to do that and when me and the kids woke up awhile later, it was all ready to eat. Give it a try. This goes in really runny and comes out looking more like a baked cake. Moist but not so runny. Pre heat oven to 350 degrees with the rack in the center. Lightly coat an 8×8 inch baking dish with cooking spray(this recipe can easily be doubled and cooked in a 9×13). 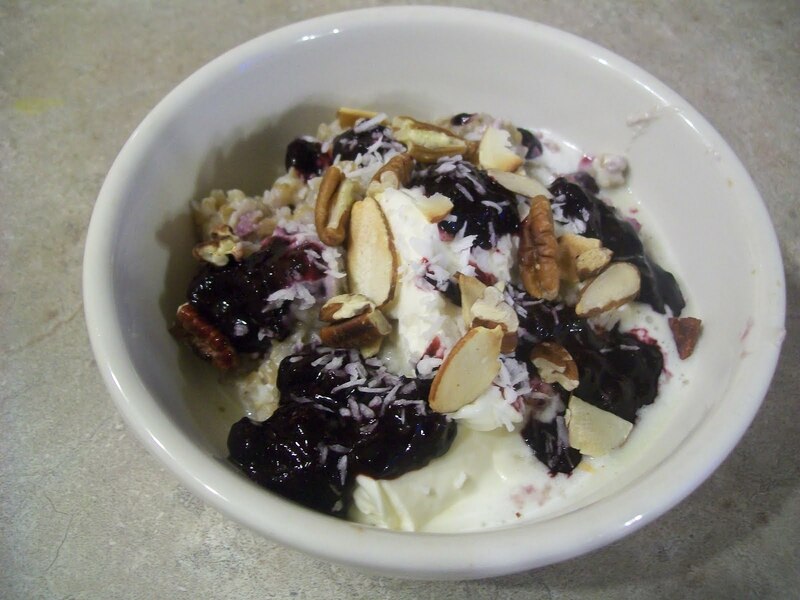 Combine all ingredients in a large bowl adding blueberries and coconut last. Sweeten to taste (I used 1/2 tsp stevia) Bake for about 55 minutes(add a few minutes if doing in a 9×13), until the oatmeal is set and not runny in the middle. Heat the blueberries with a splash of water over medium high heat. When you hear them sizzle reduce heat to medium and cook for about 5 minutes until saucy. 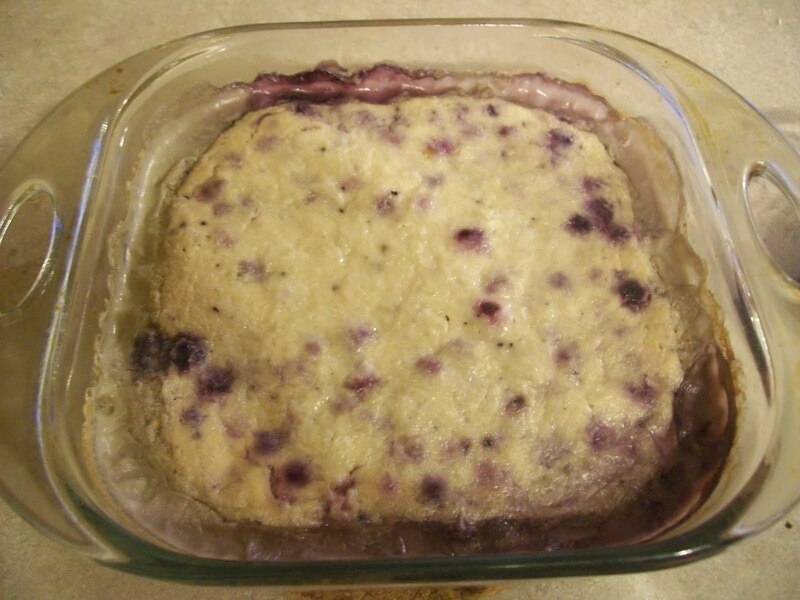 Mash the blueberries against the side of the pan with a spatula or spoon. 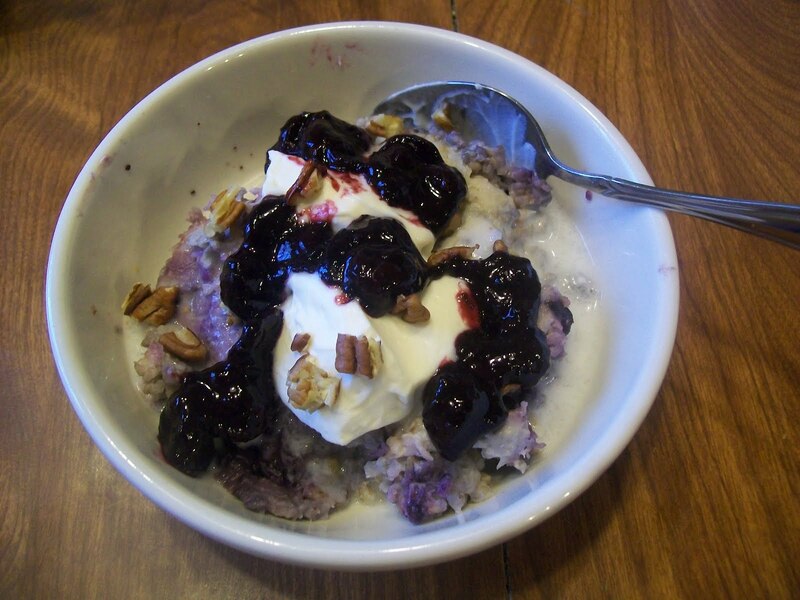 Serve oatmeal with some almond or coconut milk, whipped cream, blueberry sauce and any other optional toppings. Great as leftovers too! 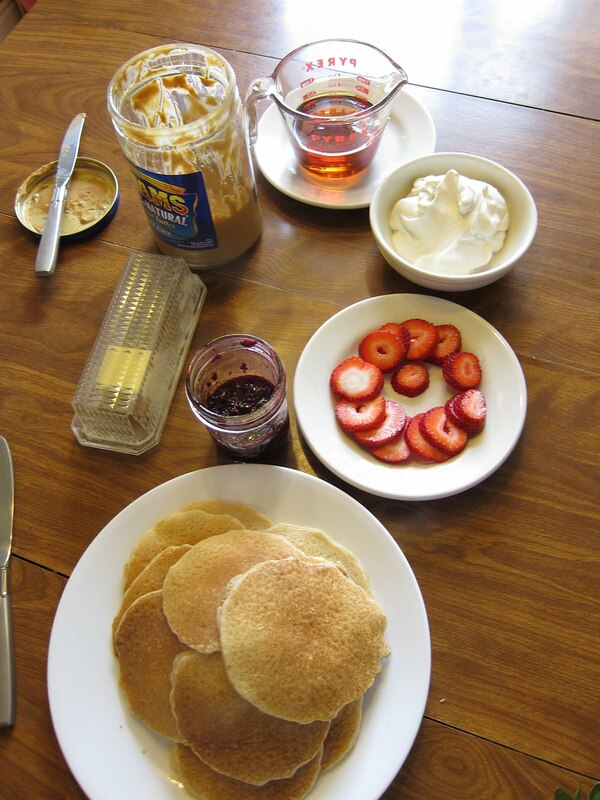 This is our favorite pancake recipe. 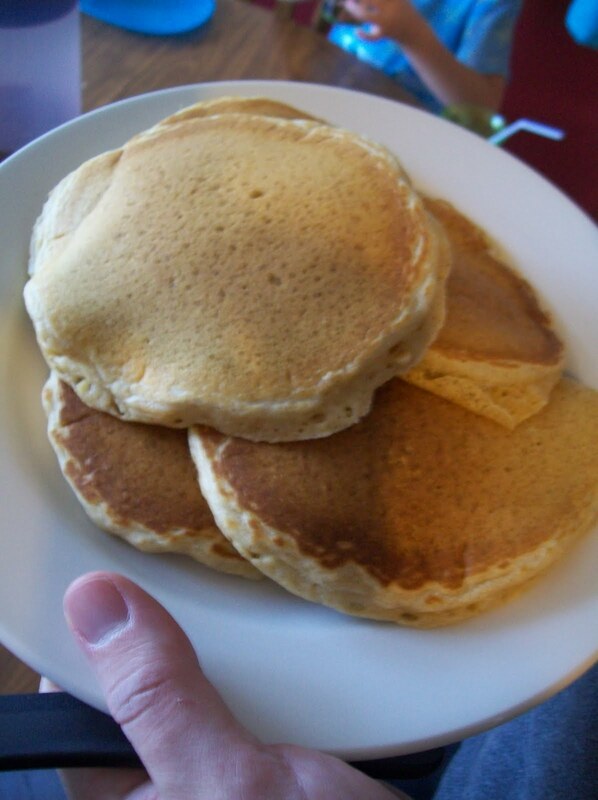 These pancakes turn out fluffy and they don’t stick to the griddle. You can halve this recipe(but if you do, don’t halve the butter/oil), but we always make this size because we like to have a few leftovers and sometimes I’ll freeze them in a freezer ziploc bag for Scott or my school-aged kids to pull out and eat during the week for breakfast. Let’s get started. Pull out all your ingredients. Take out the eggs and milk first so they have a few minutes to sit at room temperature. I did half milk and half kefir(my kefir is in the pint-sized jar). 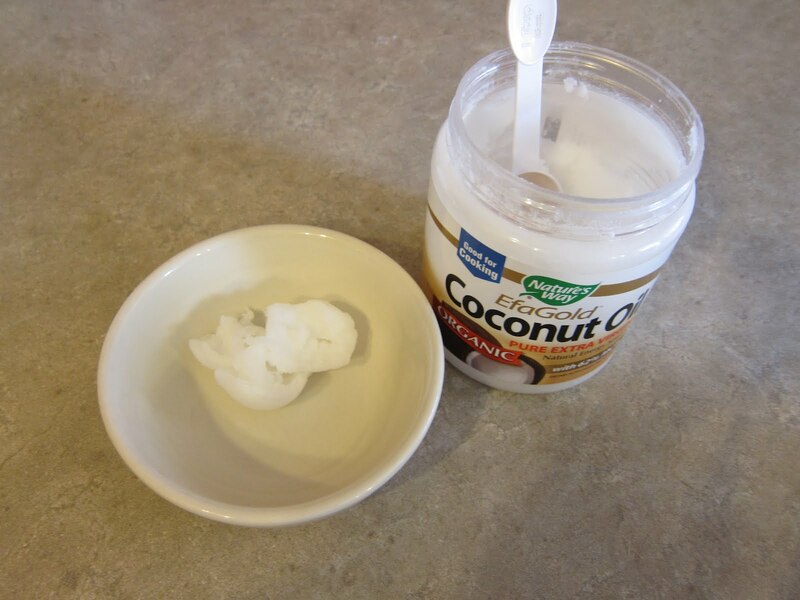 If you’re using coconut oil, this is especially important because coconut oil will harden when it’s exposed to colder temperatures. 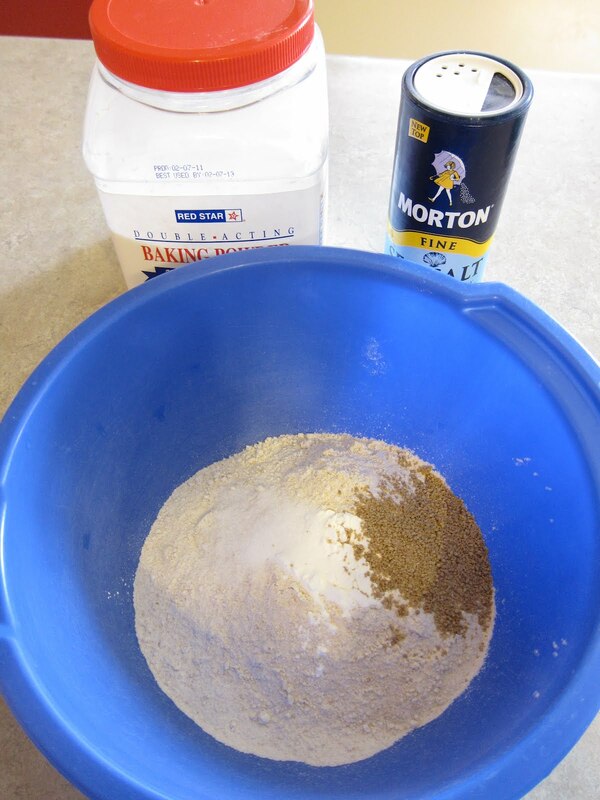 Mix together your flour, baking powder, salt and sucanat. 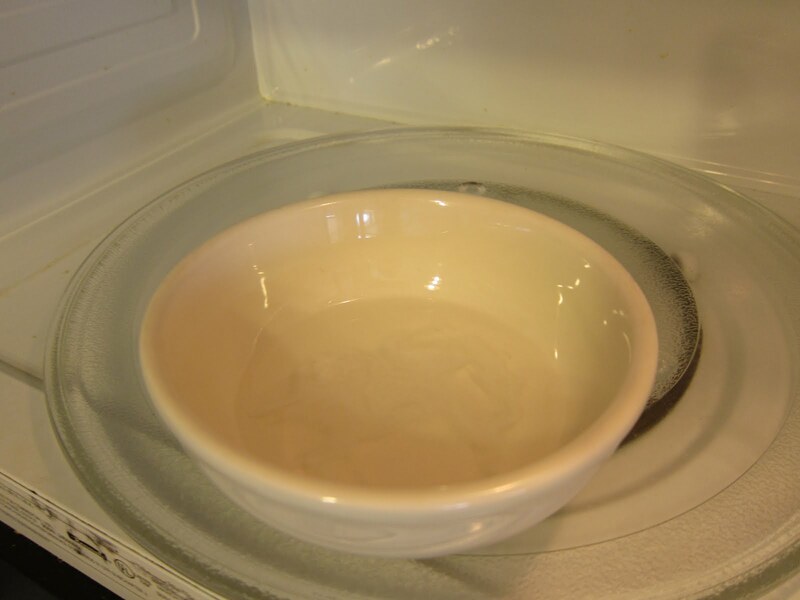 Measure your coconut oil or butter, put it in a microwaveable dish and heat it up for about 15-20 seconds until it’s soft and mostly melted. As this time, I usually pull out my pancake griddle and heat it to about 325 degrees. Add it to the dry mixture. 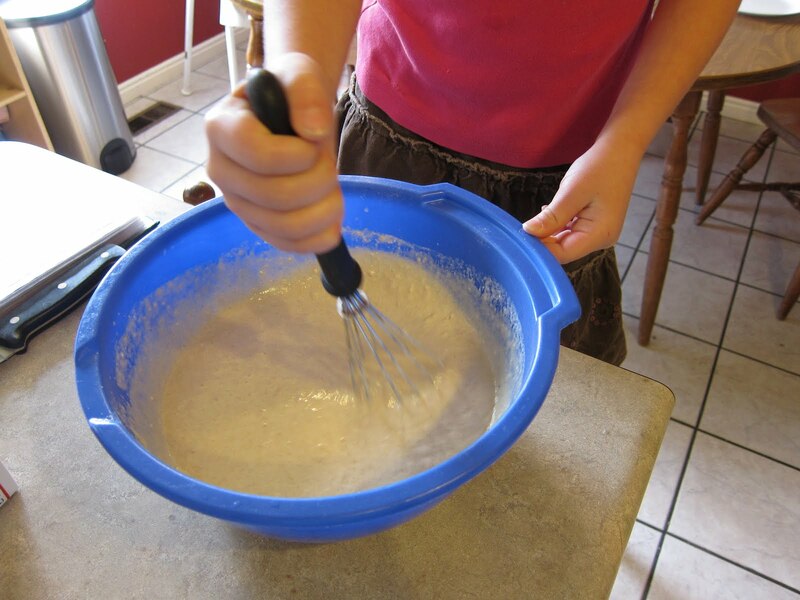 Then go ahead and add your milk/kefir and eggs and mix it up with a whisk a few times. If it seems too thick for your taste, add a tiny bit more milk, but know that the runnier the mix, the thinner the pancakes will be. You want to mix it until it’s just combined. Having little lumps is good. Try not to over mix. 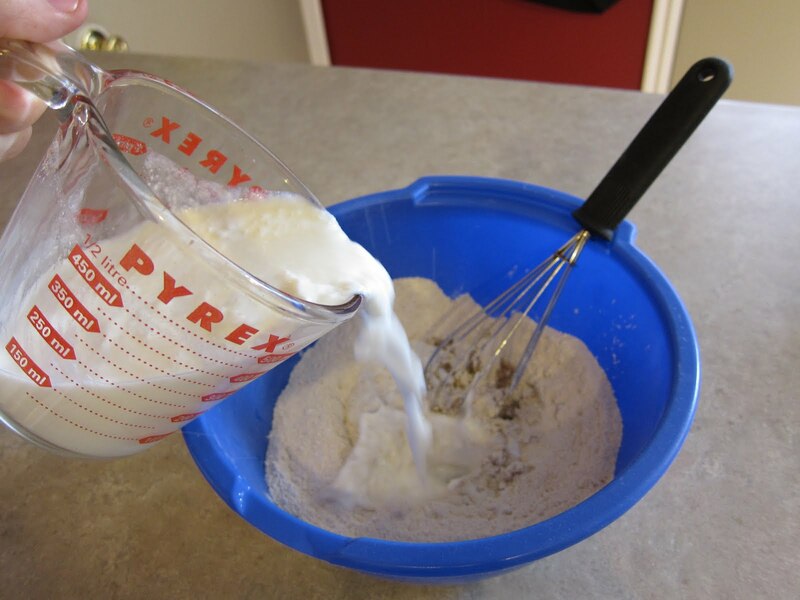 Using a 1/4 measuring cup, scoop the batter onto your hot griddle. 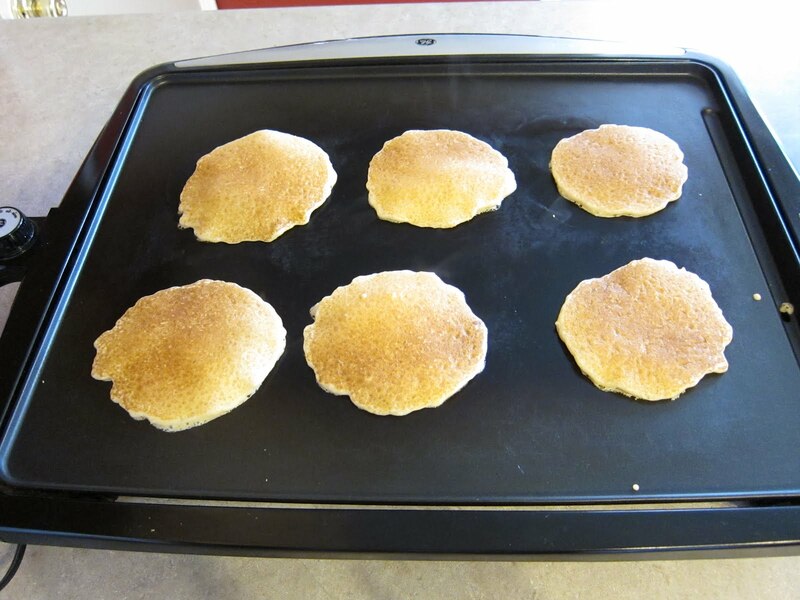 Let them cook until small bubbles form in the batter(about a couple of minutes if your griddle is warm) and then flip. Allow them to cook on the other side for another minute or until golden. Your pancakes are ready! We always top them with natural peanut butter or butter and pure maple syrup. 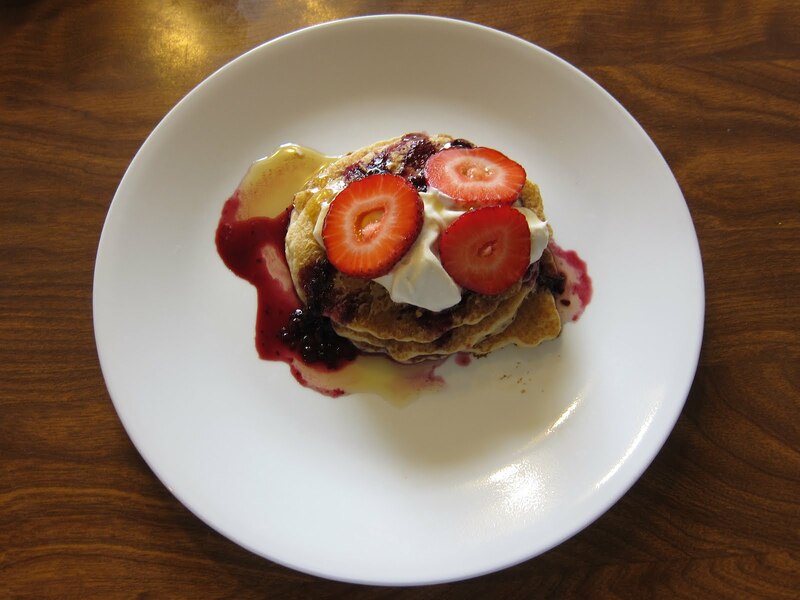 Many times I’ll also make some agave sweetened whipped cream, berry syrup(just frozen berries mashed and warmed up with a little water and maple syrup), and slice up bananas or strawberries to add on top. So yummy! Mix together the dry ingredients. Add the remaining ingredients adding milk last so you don’t add too much; you don’t want it to be really runny so use a little less if you need to. Mix together with a whisk until just combined. Don’t over mix. Cook on griddle warmed to 325 degrees and cook on each side until golden. A month or two ago I finished reading the book, Disease-Proof Your Child by Dr. Joel Fuhrman, who is a family physician and specializes in nutrition based treatments(especially for obesity and chronic disease.). Like all the other health/diet/nutrition books I’ve read in the past, I really liked some things, and some things I just kinda go, “eh, I’m not so sure about that.” But I’m glad I do that. I’m glad I don’t take everything I read as the 100% truth, even if they are written by doctors and scientists. The only thing I’ve read and believe to be completely true and base everything else I read off that document is the Word of Wisdom which is found in Doctrine and Covenants section 89 (in the Book of Mormon). Fantastic stuff! And it’s from God who knows everything so you know it’s true. Anyway, back to this book. I typed up some notes as I read the book and then from that I narrowed it down to my favorites which you can read below. The sentences in bold are key things I really like. “When the Petersons insisted, “josh won’t eat fruits or vegetables,” I explained to them that all children would eat healthfully if shipwrecked. True hunger is difficult to deny. If faced with limited options, they will gleefully eat whatever food is available, without intellectual gymnastics to get them to. “Researchers studying children’s food choices have found that the earlier in life the food is introduced, the more likely it will be favored. Parents have been shown to give up too easily when offering healthy food to their children. Keep offering the same food, even if your child rejects it. With persistence, it is likely they will eventually try it and even like it. One study showed that about 75 percent of parents gave up after five tries, while the research showed it took eight to fifteen times for children to accept a new food as familiar. Positive reinforcement, praise, and demonstration of family taste preference (showing your child how much you like it over an over) works better than forcing the child to eat it, and is better than bribing the child. Once the child does give it a shot, tasting the food again and again encourages an eventual favorable taste response. Taste is a learned phenomenon – both children and adults like the foods they were raised on the best. What is most compelling is that a study shows that even the foods that mothers eat while pregnant and nursing affect what their toddlers will prefer…..Scientific investigations illustrate that children most often take on the eating habits of their parents. Research also indicates that adults who consume lots of fruits and vegetables are those who consumed lots of these foods during childhood. What has been shown not to work is for parents to eat one way and force their children to eat a different way. In fact, parents who force dietary restraint on their children while they themselves eat unrestrainedly were shown to have an adverse effect that fostered the development of body fat on their children. When there is a true physiologic need for calories and when they are truly hungry, they will eat. You may be able to determine what they eat by what is offered or available in your home environment, but you have almost no ability to force your children to consume more food than their own internal drives them they need. It is especially difficult to get a baby or toddler to overeat. Most young ones will push food away when they are not hungry. By bribing, coaxing, tempting and teaching our little ones to constantly stuff down a few more bites, they are learning to ignore their body’s correct hunger and satiation signals. Over time, and with the help of ‘fake food’ made with artificial flavors and concentrated sweeteners, it’s very common for children to become chronic overeaters. Watch this 2 minute trailer for the health/nutrition video ‘Forks Over Knives’. It follows two men: 1.) Colin Campbell who conducted the most comprehensive research study ever done on health and nutrition(according to the NY times), and 2.) Dr. Esselstyn a clinical surgeon. It goes over their findings along with findings of other doctors and leaders. It summed up Dr. Campbells research from his book The China Study which I read last year and loved, and highly recommend, but it is a longer book so if you’re not a reader, I’d at least watch this clip and then find the movie on Netflix or through your library system. It’d be a great date night movie…Scott and I both really liked it, and it’s always good to be on the same page when it comes to nutrition and feeding your family. 1. Substitute finely ground whole wheat instead of white flour. What you see on recipe labels as “wheat flour” is actually a toxic, nutrition-less white gluey mess. It’s the grain with the germ (vitamins) and bran (fiber) removed). Ask for a good grain grinder for Christmas. I love K-Tecs, which you can find here. They aren’t terribly expensive, and you’ll need one in an emergency where you have to make your own bread, so it’s a good preparedness item. Some people think they don’t like whole wheat flour products, when in fact they’re just used to eating RANCID whole wheat. When the grain is ground, the protective shell of the grain is destroyed and oils inside begin to deteriorate. Consequently, those milled grains go rancid quickly and taste bad in baked goods. (Plus, rancid oils are carcinogenic.) Bags of whole wheat flour sometimes have spent months in warehouses and in transit before arriving in your home, and then you store them even longer. Thus a grinder becomes essential, so you can have FRESHLY milled grains anytime you want. 2. Substitute coconut palm sugar, or Sucanat, for sugar. I recently mentioned coconut sugar in a blog entry and since then, we’ve gotten many queries from readers who can’t find it, to buy. I spent some time looking for it and have obtained the best organic product I could find for a good price in the GreenSmoothieGirl store: get some here. I’m thrilled about this product because of its low glycemic index for far less impact on your blood sugar and pancreas. It has high vitamin and mineral content, it is highly sustainable, more so than cane sugar, and it tastes lovely. Sucanat is in my baking recipes in 12 Steps (it’s dried, unrefined cane juice) but coconut sugar is my new favorite and is an easy substitute. Substitute it 1:1 for any white or brown sugar called for in a baking recipe. Please buy the kind in the health food store that is ALUMINUM FREE. Don’t buy giant quantities because it’s good for only 1-2 years. Aluminum is a toxic metal your body has a very difficult time eliminating, and it’s linked to Alzheimer’s and many other health problems. And it’s in commercial baking powders. Substitute the aluminum-free version 1:1 in your recipes. Please don’t use “vegetable oil” for baking. It’s highly refined, heated to high temperatures, and already rancid when it’s sold to you. 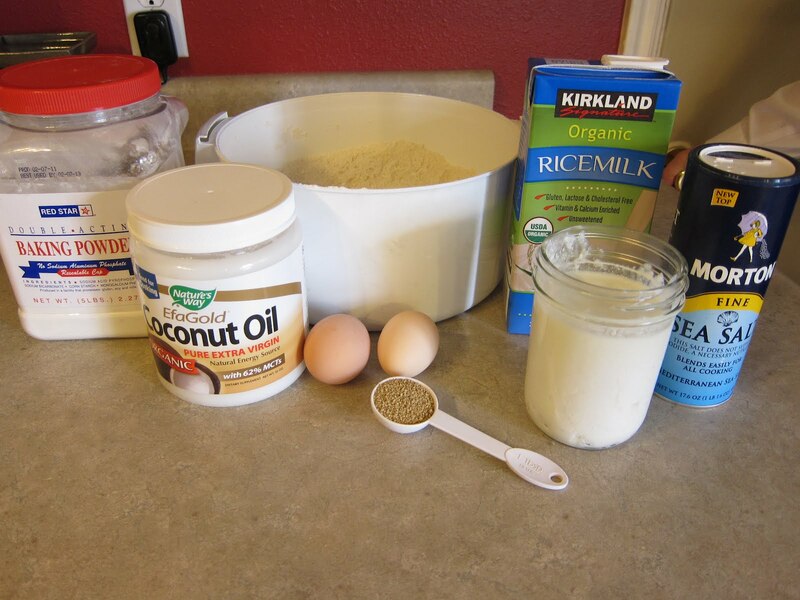 Instead, for baking, use coconut oil. In the summer, it’ll be liquid, and in the winter, solid. It works well as a substitute for butter, shortening, or oil. We have organic, cold-pressed coconut oil in our group buy every year, but year-round you can get it here. You can read here about why this oil is far more nutritious that most and what it’s good for. You can also substitute extra-virgin olive oil in recipes that call for just a small amount of butter or oil or if you don’t like coconut oil. It usually doesn’t affect the flavor. If you buy only ONE thing organic, make it eggs. North Americans get far too much Omega 6 fatty acids, probably because of our high intake of refined vegetable oil, which has a toxic imbalance. Commercial eggs are 6:1 omega 6 to omega 3. Eggs in their natural state are the exact opposite, with far more omega 3 that we are deficient in–so buy organic, free range. I have a friend in my neighborhood whose chickens are fed no chemicals and range in the yard. I buy from her on the rare occasion I even use eggs. You can also pay more at Costco for organic, and most health food stores have them. You could also use this very nutritious substitute for each large egg: let 1 Tbsp. chia seed sit in 3 Tbsp. water for 30 mins. Please never use iodized, refined salt (i.e., Morton’s) for anything besides homemade play-dough. For cooking / eating, use Original Himalayan Crystal Salt for a high-vibrational frequency completely unrefined crystalline whole food. My second favorites would be Real Salt or celtic sea salt. Now in your whole-foods lifestyle, you don’t have to throw out your favorite baking recipes. Make these 6 substitutions and you should have very good results! 1. Agave is a plant that is mostly grown in Mexico. 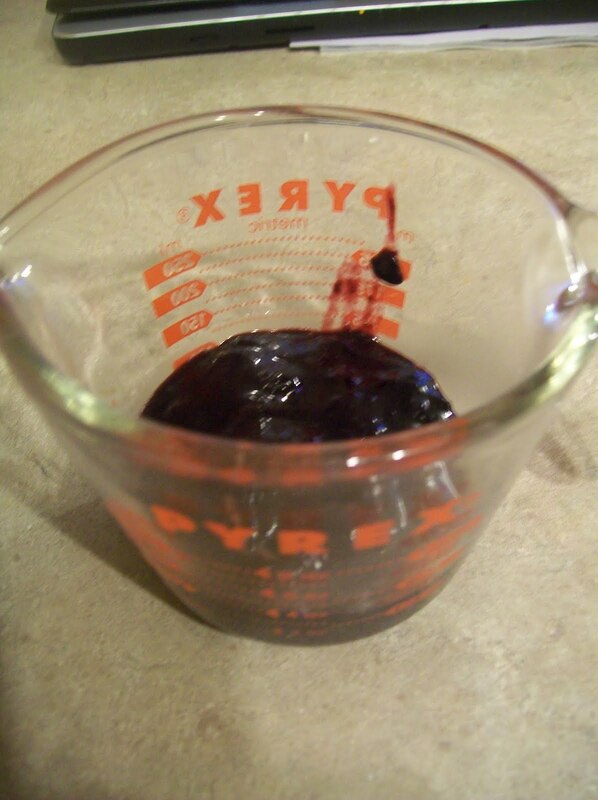 They process it to make it into a syrup…kind of like making maple sap into syrup . (by processing all I mean is that they’re bringing it to a temperature higher than 118 degrees. Some companies will keep it under this temperature so it will be raw). 2. Some of the agave companies in Mexico have gotten a bad rep because they were adding in high fructose corn syrup with agave to make it less expensive for them. 3. There are companies that don’t do this(add HFCS) and their agave is natural and safe with no additives. You can read on the label of the agave you buy and it should say on there that it’s certified, organic and USDA approved or something like that. Another good way to go is through a group buy…you just have to get a lot. The glycemic index scale starts at zero and goes to 100. According to the University of Wisconsin Center for Integrative Medicine, foods that rate between zero and 49 have a low glycemic index, foods between 50 and 70 have a moderate glycemic index and foods that rate over 70 have a high glycemic index. A 2 tbsp. 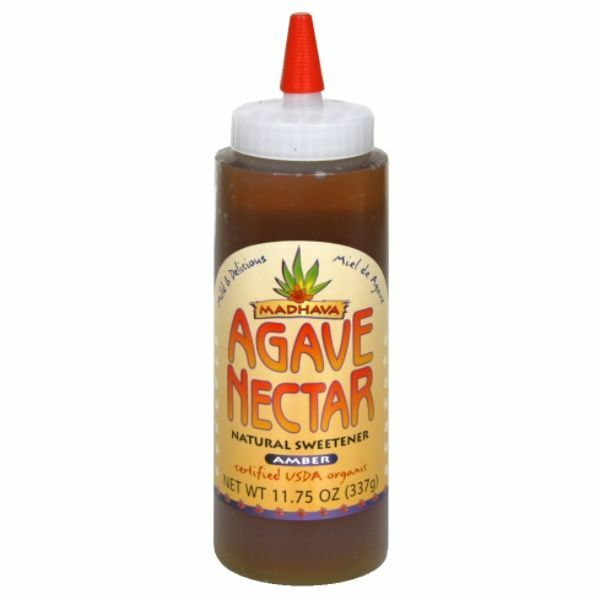 serving size of agave nectar has a glycemic index of 30, placing it in the category of low glycemic foods. In addition to considering the glycemic index rating of agave nectar, another number you may want to consider it its glycemic load. According to the UWCIM, the glycemic load of a food takes into account the percent of carbohydrate contained in a food. Foods that rate between zero and 10 have a low glycemic load, foods between 11 and 19 have a moderate glycemic index and foods that rate over 20 have a high glycemic load. A 2 tbsp. serving size of agave nectar, according to All About Agave, has a glycemic load of 9.6, placing it just at the cutoff between low and medium. To calculate the glycemic load of any food, first find the number of carbohydrates the food contains by looking at food labels or a nutrition chart. Then, multiply this number by its glycemic index, and divide the total by 100. I use agave in some things I bake, but not much. In my granola recipe I use a little, but mostly the sweetener I like in that one is raw honey. If I’m doing a sugar substitute in a baked good, I usually go with Sucanat. But sugar is sugar, so either way, I try not to do too much. I notice a difference in my body when I use agave rather than refined sugar. When I bake with agave I don’t experience the cravings I do with refined sugar. I can have just one bite or slice of something and be done, rather than over doing it with sugary sweets. I don’t feel like it’s spiking my blood sugar though I do notice the spike with sugar. Our bodies are different and will probably respond in different ways. You could try it for yourself and see how you like it. And that’s all I’ve got for now. I finished a book called, The China Study, this past week. It was very interesting. It’s the most comprehensive study that’s ever been done on diet and health. Reading and learning about the results was enlightening. The author has listed over 750 references in his book, many of which are primary sources from scientific publications. For those of you who don’t want to read the 300 page book, I’ll give you a brief summary. First I want to give you a short background on the author. Dr. Colin Campbell,who has also authored over 300 research papers, grew up on a dairy farm and did his graduate studies in animal nutrition, wanting to learn how to make cows and chickens get bigger faster. During that time, he conducted lots of research, read lots of research and began to realize the error in his ways and what nutrition and diet really meant to our health. He significantly changed his views on food. Dr Campbell says we need to be eating a more plant-based, whole foods diet. After conducting studies on rats over a long period of time and then going into areas all over China and doing lots of human blood and urine samples, watching diets etc, he found that if you eat about a 5% animal protein diet, you will be healthier and more disease free. If you eat closer to a 20% animal protein diet (which most American’s do), you’ll most likely end up having all sorts of health problems when you get into your middle and late years. Things like diabetes, cancer(breast, prostate and all the others), obesity, kidney stones, heart disease and many, many others can be prevented and fixed by a diet that is low in animal protein. They in fact injected Aflatoxin, a carcinogen, into a group of rats and then divided the rats into 2 groups. Group 1 they fed a diet with 5% animal protein. They were healthy and strong. Group 2 they fed a diet with 20% animal protein. They got fat, stopped running on their wheels and developed tumors and cancer. Then they went in and switched their diets. The rats who were dying with tumors, once they switched to the 5% animal protein diet, got rid of the tumors. They got slim and started running on their wheels again. And the opposite happened with the healthy ones. Once they changed their diet to 20% animal protein, they all got fat and developed tumors and cancer. “These findings demonstrate that a good diet is the most powerful weapon we have against disease and sickness…. “By any number of measures, America’s health is failing. We spend far more, per capita, on health care than any other society in the world, and yet two thirds of Americans are overweight, and over 15 million Americans have diabetes, a number that has been rising rapidly. We fall prey to heart disease as often as we did thirty years ago, and the War on Cancer, launched in the 1970’s, has been a miserable failure. Half of Americans have a health problem that requires taking a prescription drug every week, and over 100 million Americans have high cholesterol. Good book. After reading it I decided I’d cook meat in one meal a week (which wasn’t much different than before anyway), and that we’ll cut back on dairy. We’d already switched to Almond milk so that’s not a big deal, but cheese is going to be hard for us because we typically eat it every day. Eventually I’d like to get to doing 2 meals a week with dairy…but we’re not quite there yet. Soon hopefully. I just need to test out some more recipes. I’m not going to include yogurt in with the typical dairy for several reasons which I won’t take the time to list now. The book had some really good information. Though I’m sure it’s also a book that would make people mad; you’ll have to read it yourself if you want to know what I’m talking about. You should be able to find this book at your local library. A couple of other random thoughts on nutrition: 1. I went to a whole foods class this past weekend at our local health food store. Robyn Openshaw, the Green Smoothie Girl, taught the class. I loved it. She pointed out that just because someone isn’t overweight, doesn’t mean they’re healthy. It’s important for even the naturally skinny ones to eat healthy so they can prevent developing different health problems in the future. 2. I like Billy Blanks. He’s the Tae Bo guy. In one of his exercise dvd’s called Insane Abs, he lists three things you need to do if you want to see your abs: the first two had to do with strengthening and toning muscles, but the third caught my attention. He says you have to eat to see your abs. Several times during that dvd he mentions how important it is to eat good foods if you want to see results. I was glad he said this because there are many people out there who say, “I ____(fill in the blank with run, play sports, swim etc), so I can eat whatever I want.” I used to say that myself, but now it bugs me. I get what they’re saying, but I also think there’s more to health than just your size. I don’t know about you, but I would still like to be healthy in my 30s, 40s, 50s, 60s, and so forth. Slowing down, yes. But still healthy. I didn’t like everything I read, as is the case with all health food books, but I did take some good notes on the parts I did like. From those notes, I gathered my favorite highlights and that’s what this post is about. If you were curious about the book, but didn’t want to read the whole thing, this post is for you. If you have no interest in health, stop here; this will just bore you. Pollan says that the absence of nutrients in our bodies(that we get from plants) may counteract the normal feeling of satiety after enough calories are eaten. “Don’t eat anything your great grandmother wouldn’t recognize. “There are in fact hundreds of foodish products in the supermarket that your ancestors simply wouldn’t recognize as food: breakfast cereal bars transected by bright white veins representing, but in reality having nothing to do with, milk; ‘protein waters’ and ‘nondairy creamer’; cheeselike food stuffs equally innocent of any bovine contribution; cakelike cylinders (with creamlike fillings) called Twinkies that never grow stale. Don’t eat anything incapable of rotting is another personal policy you might consider adopting. “One of the problems with the products of food science is that…they lie to your body; their artificial colors and flavors and synthetic sweeteners and novel fats confound the senses we rely on to assess new foods and prepare our bodies to deal with them. Foods that lie leave us with little choice but to eat by the numbers, consulting labels rather than our senses. And here’s another short quote I liked which talks about the importance of eating meals together as a family. Some people wonder how vegans and vegetarians get their protein. That’s not a big surprise considering the large amount of money and influence in the meat and dairy companies. They’re the ones who fund much of the health/nutrition education in schools. 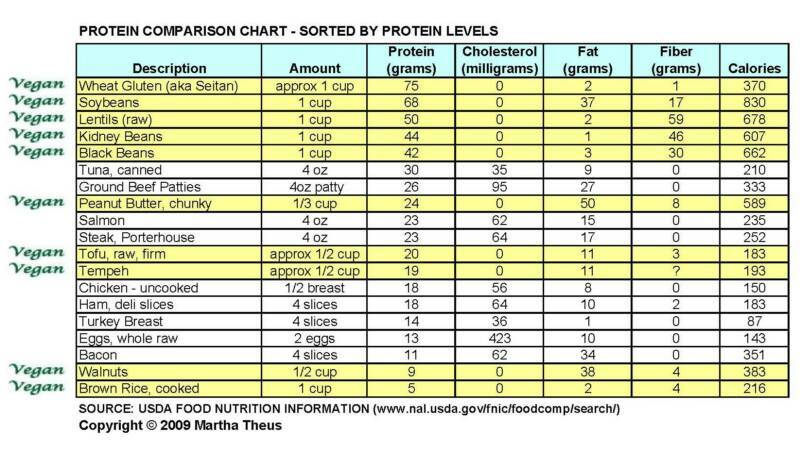 If you look at this chart you’ll see that the first five items on this list, the items that have the most protein, are all vegetarian/vegan. Black beans, kidney beans, lentils, wheat gluten, etc. And peanut butter has more than most meats as well. I’m not 100% vegetarian(though I mostly don’t like meat) but I thought this chart was good enough to share.